Philadelphia's Monkey Mind Zen group is affiliated with the Kwan Um School of Zen, an international organization of more than one hundred Zen centers and groups. The school was founded by Zen Master Seung Sahn, a Korean Monk in the Jogye order and the first Korean Zen Master to live and teach in the west. He served as its guiding teacher until his death in 2004. Zen Master Seung Sahn is the 78th teacher in his line of dharma transmission which extends back through the Chogye Order to Taego Pou (1301 – 1382), a student and dharma heir of Shih-Wu in China. Upstream of Shih-Wu we meet Nan-yuan, Lin-chi, Huang-Po, Pai-Chang, Matsu, and Hui-Neng, the Sixth Patriarch, from whom all Zen schools trace their ancestry. Seung Sahn Soen-sa was born in 1927 in Seun Choen, North Korea. His parents were Protestant Christians. Korea at this time was under severe Japanese military rule, and all political and cultural freedom was brutally suppressed. In 1944, Soen-sa joined the underground Korean independence movement. Within a few months he was caught by the Japanese police and narrowly escaped a death sentence. After his release from prison, he and two friends stole several thousand dollars from their parents and crossed the heavily-patrolled Manchurian border in an unsuccessful attempt to join the Free Korean Army. In the years following World War II, while he was studying Western philosophy at Dong Guk University, the political situation in South Korea grew more and more chaotic. One day Soen-sa decided that he wouldn't be able to help people through his political activities or his academic studies. So he shaved his head and went into the mountains, vowing never to return until he had attained the absolute truth. For three months he studied the Confucian scriptures, but he was unsatisfied by them. Then a friend of his, who was a monk in a small mountain temple, gave him the Diamond Sutra, and he first encountered Buddhism. "All things that appear in this world are transient. If you view all things that appear as never having appeared, then you will realize your true self." When he read these words, his mind became clear. For the next few weeks he read many sutras. Finally, he decided to become a Buddhist monk and was ordained in October, 1948. Soen-sa had already understood the sutras. He realized that the only important thing now was practice. So ten days after his ordination, he went further up into the mountains and began a one-hundred-day retreat on Won Gak Mountain (the Mountain of Perfect Enlightenment). He ate only pine needles, dried and beaten into a powder. For twenty hours every day he chanted the Great Dharani of Original Mind Energy. Several times a day he took ice-cold baths. It was a very rigorous practice. Soon he was assailed by doubts. Why was this retreat necessary? Why did he have to go to extremes? Couldn't he go down to a small temple in a quiet valley, get married like a Japanese monk, and attain enlightenment gradually, in the midst of a happy family? One night these thoughts became so powerful that he decided to leave and packed his belongings. But the next morning his mind was clearer, and he unpacked. A few days later the same thing happened. And in the following weeks, he packed and unpacked nine times. By now fifty days had passed, and Soen-sa's body was very exhausted. Every night he had terrifying visions. Demons would appear out of the dark and make obscene gestures at him. Ghouls would sneak up behind him and wrap their cold fingers around his neck. Enormous beetles would gnaw his legs. Tigers and dragons would stand in front of him, bellowing. He was in constant terror. After a month of this, the visions turned into visions of delight. Sometimes Buddha would come and teach him a sutra. Sometimes Bodhisattvas would appear in gorgeous clothing and tell him that he would go to heaven. Sometimes he would keel over from exhaustion and Kwan Se Um Bosal would gently wake him up. By the end of eighty days, his body was strong. His flesh had turned green from the pine needles. One day, a week before the retreat was to finish, Soen-sa was walking outside, chanting and keeping rhythm with his moktak. Suddenly, two boys, eleven or twelve years old, appeared on either side of him and bowed. They were wearing many-colored robes, and their faces were of an unearthly beauty. Soen-sa was very surprised. His mind felt powerful and perfectly clear, so how could these demons have materialized? He walked ahead on the narrow mountain path, and the two boys followed him, walking right through the boulders on either side of the path. They walked together in silence for a half-hour, then, back at the altar, when Soen-sa got up from his bow, they were gone. This happened every day for a week. Finally it was the hundredth day. Soen-sa was outside chanting and hitting the moktak. All at once his body disappeared, and he was in infinite space. From far away he could hear the moktak beating, and the sound of his own voice. He remained in this state for some time. When he returned to his body, he understood. The rocks, the river, everything he could see, everything he could hear, all this was his true self. All things are exactly as they are. The truth is just like this. Soon after he came down from the mountain, he met Zen Master Ko Bong, whose teacher had been Zen Master Mang Gong. 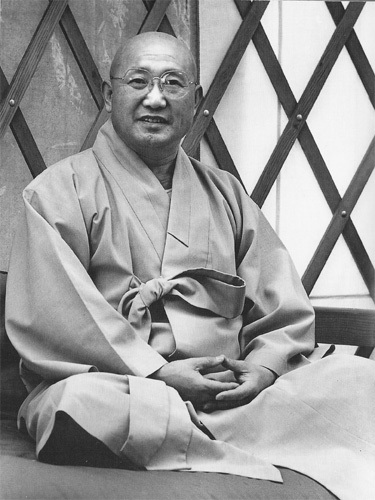 Ko Bong was reputed to be the most brilliant Zen Master in Korea, and one of the most severe. At this time he was teaching only laymen; monks, he said, were not ardent enough to be good Zen students. Soen-sa wanted to test his enlightenment with Ko Bong, so he went to him with a moktak and said, "What is this?" Ko Bong took the moktak and hit it. This was just what Soen-sa had expected him to do. Soen-sa then said, "How should I practice Zen?" Ko Bong said, "A monk once asked Zen Master Jo-ju, 'Why did Bodhidharma come to China?' Jo-ju answered, 'The pine tree in the front garden.' What does this mean?" Soen-sa understood, but he didn't know how to answer. He said, "I don't know." Ko Bong said, "Only keep this don't-know mind. That is true Zen practice." That spring and summer, Soen-sa did mostly working Zen. In the fall, he sat for a hundred-day meditation session at Su Dok Sa monastery, where he learned Zen language and Dharma-combat. By the winter, he began to feel that the monks weren't practicing hard enough, so he decided to give them some help. One night, as he was on guard-duty (there had been some burglaries), he took all the pots and pans out of the kitchen and arranged them in a circle in the front yard. The next night, he turned the Buddha on the main altar toward the wall and took the incense-burner, which was a national treasure, and hung it on a persimmon tree in the garden. By the second morning the whole monastery was in an uproar. Rumors were flying around about lunatic burglars, or gods coming from the mountain to warn the monks to practice harder. The third night, Soen-sa went to the nuns' quarters, took seventy pairs of nuns' shoes and put them in front of Zen Master Dok Sahn's room, displayed as in a shoe store. But this time, a nun woke up to go to the outhouse and, missing her shoes, she woke up everyone in the nuns' quarters. Soen-sa was caught. The next day he was brought to trial. Since most of the monks voted to give him another chance (the nuns were unanimously against him), he wasn't expelled from the monastery. But he had to offer formal apologies to all the high monks. First he went to Dok Sahn and bowed. Dok Sahn said, "Keep up the good work." Then he went to the head nun. She said, "You've made a great deal too much commotion in this monastery, young man." Soen-sa laughed and said, "The whole world is already full of commotion. What can you do?" She couldn't answer. Next was Zen Master Chun Song, who was famous for his wild actions and obscene language. Soen-sa bowed to him and said, "I killed all the Buddhas of past, present, and future. What can you do?" Chun Song said, "Aha!" and looked deeply into Soen-sa's eyes. Then he said, "What did you see?" Soen-sa said, "You already understand." Chun Song said, "Is that all?" Soen-sa said, "There's a cuckoo singing in the tree out- side the window." Chun Song laughed and said, "Aha!" He asked several more questions, which Soen-sa answered without difficulty. Finally, Chun Song leaped up and danced around Soen-sa, shouting, "You are enlightened! You are enlightened!" The news spread quickly, and people began to understand the events of the preceding days. On January 15, the session was over, and Soen-sa left to see Ko Bong. On the way to Seoul, he had interviews with Zen Master Keum Bong and Zen Master Keum Oh. Both gave him inga, the seal of validation of a Zen student's great awakening. Soen-sa arrived at Ko Bong's temple dressed in his old patched retreat clothes and carrying a knapsack. He bowed to Ko Bong and said, "All the Buddhas turned out to be a bunch of corpses. How about a funeral service?" Ko Bong said, "Prove it!" Soen-sa reached into his knapsack and took out a dried cuttlefish and a bottle of wine. "Here are the leftovers from the funeral party." Ko Bong said, "Then pour me some wine." Soen-sa said, "Okay. Give me your glass." Ko Bong held out his palm. Soen-sa slapped it with the bottle and said, "That's not a glass, it's your hand!" Then he put the bottle on the floor. Ko Bong laughed and said, "Not bad. You're almost done. But I have a few questions for you." He proceeded to ask Soen-sa the most difficult of the seventeen-hundred traditional Zen kong-ans. Soen-sa answered without hindrance. Then Ko Bong said, "All right, one last question. The mouse eats cat-food, but the cat-bowl is broken. What does this mean?" Soen-sa said, "The sky is blue, the grass is green." Ko Bong shook his head and said, "No." Soen-sa was taken aback. He had never missed a Zen question before. His face began to grow red as he gave one "like this" answer after another. Ko Bong kept shaking his head. Finally Soen-sa exploded with anger and frustration. "Three Zen Masters have given me inga! Why do you say I'm wrong?!" Ko Bong said, "What does it mean? Tell me." For the next fifty minutes, Ko Bong and Soen-sa sat facing each other, hunched like two tomcats. The silence was electric. Then, all of a sudden, Soen-sa had the answer. It was "just like this." When Ko Bong heard it, his eyes grew moist and his face filled with joy. He embraced Soen-sa and said, "You are the flower; I am the bee." On January 25, 1949, Soen-sa received from Ko Bong the Transmission of Dharma, thus becoming the Seventy-Eighth Patriarch in this line of succession. It was the only Transmission that Ko Bong ever gave. After the ceremony, Ko Bong said to Soen-sa, "For the next three years you must keep silent. You are a free man. We will meet again in five hundred years." Soen-sa was now a Zen Master. He was twenty-two years old.